I had this auction saved and when I realised I had only seconds left I made an impulse bid. Can anyone explain the plum coloured vitrified saucers, presumably 739s? I sure hope the cups are 863s! I suspect that the plum and teal saucers will all be 739s. The teal saucer probably belongs to a Carlton cup (shape 755) but could also work for a teal or Reflections on Teal vitrified tulip (shape 863). As I will not be seeing my duos for a while, cathys1, could you please tell me whether your vitrified plum saucers are exactly the same as the teal one. I think they must be, but it will be an interesting surprise if they are not. 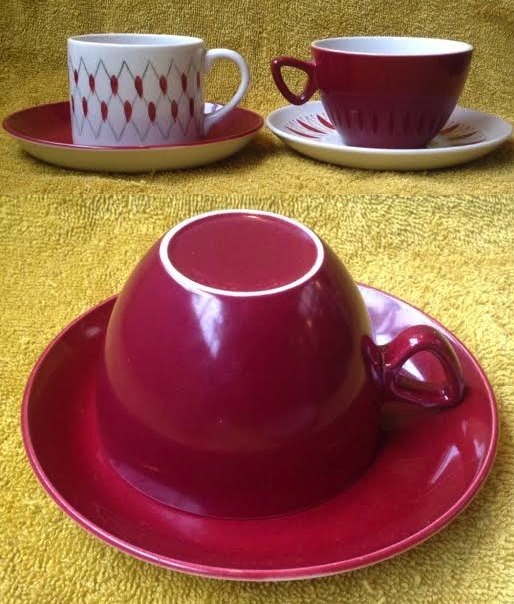 The saucers for the Red Tango duo (Air NZ shape, 783 or 3612) are wider and a bit flatter and have a bigger cup well, and of course they are not plain red but patterned on white: I don't think I know the shape number. I'm not really up on colour glaze colours but I think plum and Tango Red are distinctly different. I have yet to see a Red Tango duo in the Cook & Serve coffee can shape, and I don't recall seeing a Blue Tango duo in the Air NZ shape, but I have seen Blue Tango saucers for sale on trademe, that are not demitasse ones, so matching plain Tango Blue cups will be out there somewhere to fit them. 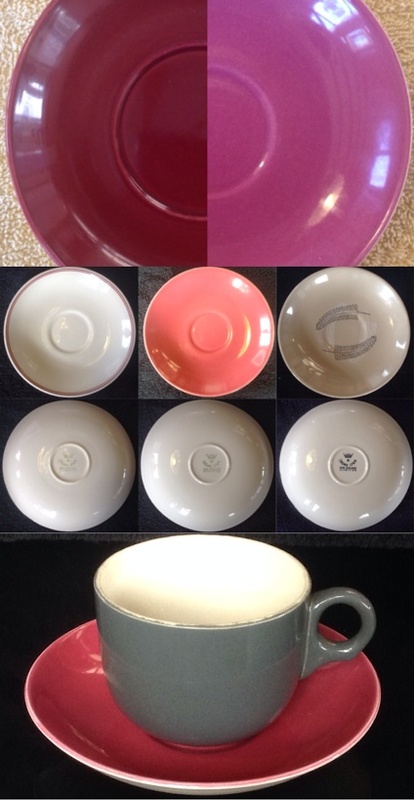 As vitrified duos were primarily made for commercial use there may even be monogrammed cups for the plum saucers. Questions have been asked on other topics about how many colour glaze colours there are but I am not sure anyone has yet compiled a list of vitrified plain colours. I sort of made a start in the Cook & Serve coffee can topic. Black, white, mushroom (Reflections), Tango Blue, Cook & Serve yellow, primrose yellow, (chrome) yellow, "oyster", lime green, olive green, dark brown, (Mexico) red, (Tango) red, plum, and teal, which makes 15 if the two reds and plum are all different, and then there is also duck egg blue speckle but that may not count. I'm not sure what colour fi's 863 in the gallery is. Any other plain vitrified colours? The plum and teal saucers are just like the normal colourglaze, same thickness but a fraction smaller in diameter. I would not pick them as being vitrified if not for the backstamp. The colours are standard and match the tulip cups. I have some unmarked teal cups the same shape as the Air New Zealand cups which go with the teal saucer. The red tango colour is very different than the plum saucer. I will load a photo later if I can work out how to do it. I have sat the Tango cup on the Mexico saucer for comparison. It may be that the same colour of glaze is used but the glaze on the Mexico looks thinner and lighter. I think in this instance the lighting has amplified the difference. 739 Vitrified Saucers and 755 Carlton cups. In the Q&A section of a trademe auction for a Reflections saucer for sale by her husband, Jeremy, Gemma (forum member banker) and I nutted out that the correct cup for the plum vitrified saucers is the 755 Carlton cup. The 755 Carlton cups are more often seen in Reflections pattern, clear glaze (with or without monograms etc), or teal, but every now and then one turns up in an interesting "colour glaze" colour. I have one in dark grey, but have seen the plum 755 in an auction not so long ago: unfortunately I can find it no more so it may have been sold. The 739 saucer is the vitrified equivalent of the 805 [this is a correction: I originally wrote 802 here] coupe saucer which is matched with the tulip cup. I have a few 739 saucers now. They all have the single star vitrified backstamp, the Reflections one typically in black. There is quite a variation in diameter between these examples but I am confident they are all the same shape. Bottom: cup/saucer 755/739 grey/plum. Colours not as true as top pic. My notes show - saucer 4615 was used for 2 cup shapes 755 and 3619 Does that help any? I have Carlton Cups in pale speckled blue, Teal & Mushroom if that helps, I assume they are all vitrified. I believe so, Kat, but there is an earthenware Carlton cup somewhere in the gallery. I think I have one in teal as well: the colour and shape look really good together. Although the duck egg blue speckled has been seen on earthenware I would assume on a Carlton cup that it would be vitrified. I'm still not sure I like the glaze for cups but love it on the tankard jugs. I think the mushroom will be a Reflections cup: they were not marked as such. 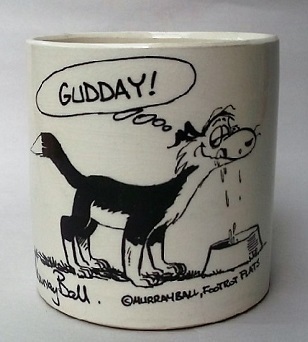 I believe I have also seen a Carlton cup in bright yellow, perhaps in the same auction as the plum one. The grey on plum is not a great colour combination but until I get a grey saucer or plum cup that is it! Where are all the coloured 739 saucers??? I have tended to say "4619" as it is supposed to have replaced the 4615 and we do not have an example of the 4615 in the gallery. I am happy to stand corrected. Check it out: Val's duo is the montage with the white background where all mine are black. As the replacement occurred on 8/5/69 and my Reflections 755 cups and saucers are either unmarked or marked with a "9" for 1969 I cannot be sure, but I think generally saucers with foot rings were replaced with the hollow-bottom type (you know, where the body of the saucer forms the footring), so one of these being 4615 and the other 4619 makes some sense. The gallery photos can only show so much so when I photograph a saucer I try to give multiple images to show profile, top, AND base.